Note that Sample Purification beads are not included in this kit. If beads are required, we recommend ordering the NEBNext® Ultra™ II Directional RNA Library Prep with Sample Purification Beads (NEB #E7765). 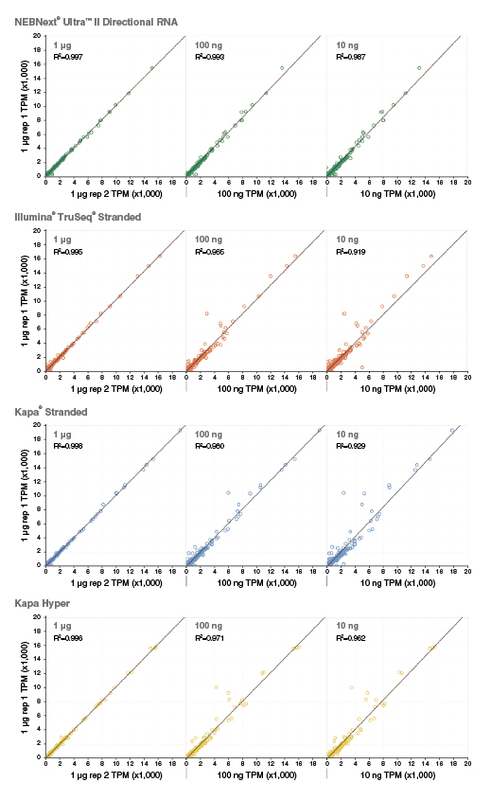 Do you need increased sensitivity and specificity from your RNA-seq experiments? Do you have ever-decreasing amounts of input RNA? To address these challenges, our next generation of strand-specific RNA library prep kits have been reformulated at each step, resulting in several fold higher yields of high quality libraries and enabling use of lower input amounts and fewer PCR cycles. The Ultra II Directional RNA kit uses the “dUTP method” (1, 2) for strand-specificity, and has a streamlined, automatable workflow. The Ultra II Directional RNA Library Prep Kit for Illumina delivers significantly increased sensitivity and specificity from your RNA-seq experiments, from ever-decreasing amounts of input RNA. In conjunction with ribosomal RNA (rRNA) depletion or poly(A) enrichment, the kit enables the production of high quality libraries from 5 ng or 10 ng of Total RNA, respectively, up to 1µg. Strand-specific/directional methods for sequencing RNA provide information on the DNA strand from which the RNA strand was transcribed. This is useful for many reasons including: Identification of antisense transcripts, determination of the transcribed strand of noncoding RNA, and measurement of expression levels of coding or noncoding overlapping transcripts. Overall, the ability to determine the originating strand can substantially enhance the value of a RNA-seq experiment. 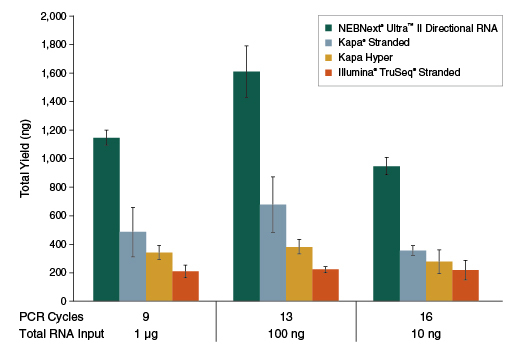 The NEBNext Ultra II Directional RNA Library Prep Kit derives its directionality from the “dUTP” method for strand-specificity, with proven superiority for this application. See what customers are saying about NEBNext Ultra II Directional RNA. Compatible with NEBNext poly(A) mRNA Isolation, rRNA Depletion reagents and multiplexing adaptors and primers. Also available with optional SPRIselect® beads for clean-up and size-selection steps. Please note that adaptors, primers, rRNA depletion reagents and poly(A) mRNA isolation reagents are not included in the kit and are available separately. For extensive NEBNext Ultra II performance data, click the links in the Features above and download our technical note for poly(A) mRNA isolation or our technical note for rRNA depletion. Poly(A)-containing mRNA was isolated from Human Universal Reference RNA (Agilent #740000), and libraries were made using the NEBNext Ultra II Directional RNA Kit (plus the NEBNext Poly(A) mRNA Magnetic Isolation Module), Kapa Stranded mRNA-Seq Kit, Kapa mRNA HyperPrep Kit and Illumina TruSeq Stranded mRNA Kit. The input RNA amount and number of PCR cycles are indicated. Library yields from an average of three replicates are shown. View additional data on library yields. Poly(A)-containing mRNA was isolated from Human Universal Reference RNA (Agilent #740000), and libraries were made using the NEBNext Ultra II Directional RNA Kit (plus the NEBNext Poly(A) mRNA Magnetic Isolation Module), Illumina TruSeq Stranded mRNA Kit, Kapa Stranded mRNA-Seq Kit and Kapa mRNA HyperPrep Kit. Libraries were sequenced on an Illumina NextSeq® 500 using paired-end mode (2x76 bp). Reads were mapped to the hg19 reference genome. GC content distribution for each library was calculated using mapped reads. 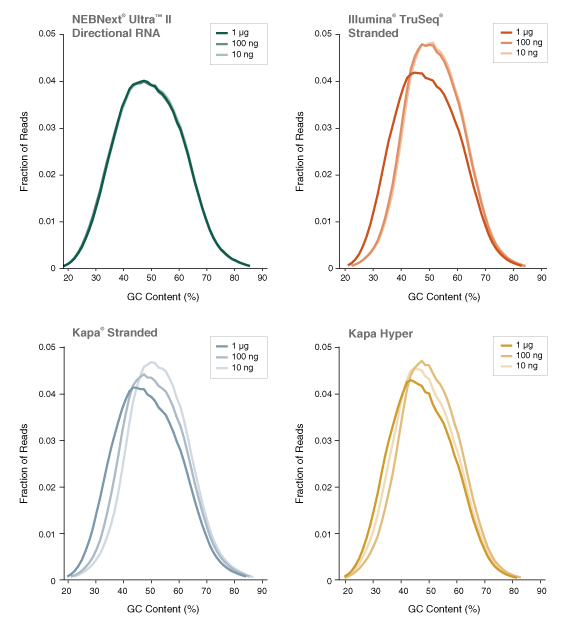 Ultra II Directional RNA libraries had uniform GC content distribution across a range of input amounts, whereas for other kits the GC content distribution changed with different input amounts, indicating the introduction of input-dependent sequence bias. View additional data on library quality. Poly(A)-containing mRNA was isolated from Human Universal Reference RNA (Agilent #740000), and libraries were made using the NEBNext Ultra II Directional RNA Kit (plus the NEBNext Poly(A) mRNA Magnetic Isolation Module), Illumina TruSeq Stranded mRNA Kit, Kapa Stranded mRNA-Seq Kit and Kapa mRNA HyperPrep Kit. Libraries were sequenced on an Illumina NextSeq® 500 using paired-end mode (2x76 bp). 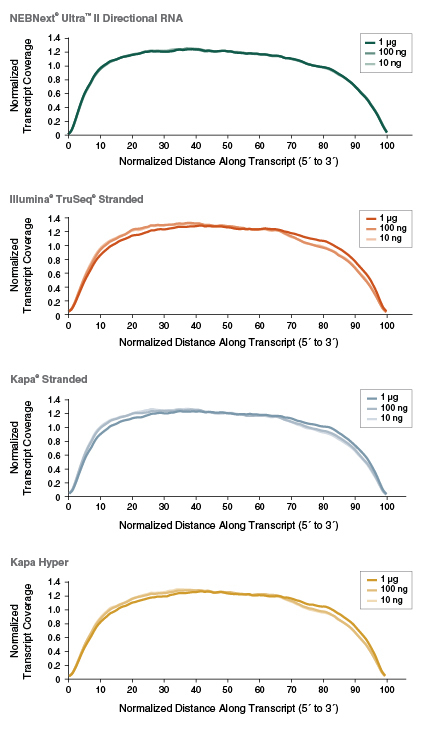 This view of the 5´ to 3´coverage of RefSeq transcripts reveals consistent coverage for Ultra II Directional RNA libraries as input RNA is decreased from 1 μg to 10 ng. The changes apparent in other kits result from loss of coverage at the 3´ end of some transcripts. View additional data on transcript coverage. Poly(A)-containing mRNA was isolated from Human Universal Reference RNA (Agilent #740000), and libraries were made using the NEBNext Ultra II Directional RNA Kit (plus the NEBNext Poly(A) mRNA Magnetic Isolation Module), Illumina TruSeq Stranded mRNA Kit, Kapa Stranded mRNA-Seq Kit and Kapa mRNA HyperPrep Kit. Libraries were sequenced on an Illumina NextSeq® 500 using paired-end mode (2x76 bp). Salmon 0.4.0 was used for read mapping and quantification of all GENCODE v25 transcripts. TPM = Transcripts Per Kilobase Million. R2 values for the linear fit are shown. 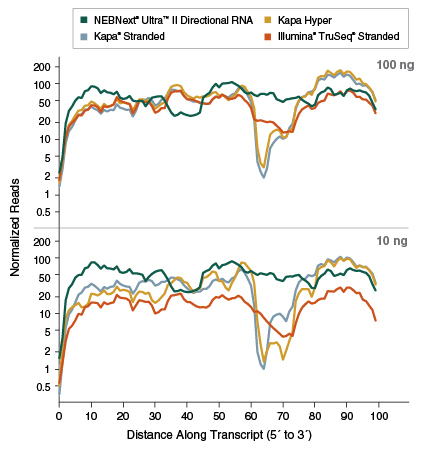 Correlation analysis of the transcripts indicates superior transcript expression correlation between the different inputs for Ultra II Directional RNA libraries. View additional data on library complexity. Ribosomal RNA was depleted from human adult normal liver tissue FFPE Total RNA (Biochain # R2234149. RIN 2.5) and libraries were made using NEBNext Ultra II Directional RNA Kit (plus the NEBNext rRNA Depletion Kit (Human/Mouse/Rat)), Kapa Stranded RNA-Seq Kit with RiboErase, Kapa HyperPrep Kit with RiboErase, and Illumina TruSeq Stranded Total RNA Library Prep Kit with Ribo-Zero™ Gold. Libraries were sequenced on an Illumina NextSeq® 500 using paired-end mode (2x76 bp). Read pairs were assessed to be rRNA if they contain 6 or more 32 base matches to 18S, 28S, 5S, 5.8S, 16S or 12S human rRNA sequences (mirabait 4.9). Percent rRNA remaining was calculated by dividing rRNA reads by the total number of reads passing instrument quality filtering. Average percent rRNA remaining is shown for three replicates. The NEBNext rRNA Depletion Ultra II Directional RNA workflow is the most efficient in removing rRNA from total FFPE RNA. Ribosomal RNA was depleted from human adult normal liver tissue FFPE Total RNA (Biochain # R2234149. RIN 2.5), and libraries were made using NEBNext Ultra II Directional RNA Kit (plus the NEBNext rRNA Depletion Kit (Human/Mouse/Rat)), Illumina TruSeq Stranded Total RNA Library Prep Kit with Ribo-Zero™ Gold, Kapa Stranded RNA-Seq Kit with RiboErase and Kapa HyperPrep Kit with RiboErase. Libraries were sequenced on an Illumina NextSeq® 500 using paired-end mode (2x76 bp). Coverage across the length of this individual transcript (ENST00000625158.1; AP000769.1-201) was assessed by mapping reads directly to the GENCODE v25 transcripts and examining 100 bins along the transcript length. 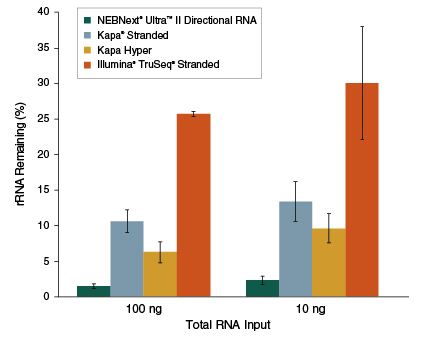 NEBNext Ultra II Directional RNA libraries provided coverage across the entire length of the transcript even as input was decreased from 100 ng to 10 ng. View additional data on FFPE RNA samples. What is the difference between the NEBNext Ultra II Directional RNA Library Prep Kit (NEB #E7760) and the NEBNext Ultra II RNA Library Prep Kit (NEB #E7770)? What is the difference between the NEBNext Ultra II Directional RNA Library Prep Kit (NEB #E7760) and the original NEBNext Ultra Directional RNA Library Prep Kit (NEB #E7420)? What is the starting material I need to use when preparing libraries using the NEBNext Ultra II Directional RNA kit? Which kit can I use to isolate Poly (A) mRNA from total RNA? Which kit can I use to deplete ribosomal RNA (rRNA) from human, mouse or rat RNA? Does the kit include adaptor and primers? Is it possible to reduce the volume of beads added during the second strand synthesis cleanup step of the protocol for E7760, E7765, E7770, and E7775? Limited Use Label LIcense: This product and its use are the subject of one or more issued and/or pending U.S. and foreign patent applications owned by Max Planck Gesellschaft. The purchase of this product from New England Biolabs, Inc., its affiliates, or its authorized resellers and distributors conveys to the buyer the non-transferable right to use the purchased amount of the product and components of the product in research conducted by the buyer (whether the buyer is an academic or for profit entity) or for limited commercial purposes that are pre-approved by New England Biolabs, Inc. The purchase of this product does not convey a license under any claims in the foregoing patents or patent applications directed to producing the product. The buyer cannot sell or otherwise transfer this product or its components to a third party or otherwise use this product for the following COMMERCIAL PURPOSES: (1) use of the products or its components in manufacturing; (2) use of the product or its components for therapeutic or prophylactic purposes in humans or animals. ILLUMINA®, TRUSEQ®, NEXTSEQ® and RIBO-ZERO® are registered trademarks of Illumina, Inc.
SPRISELECT® and AMPURE® are registered trademarks of Beckman Coulter, Inc.